Ana Carrasco on the podium at Donington Park earlier this year. Women are showing the boys’ club how it’s done in racing lately, as they often do—like 17-year-old Hailie Deegan winning a NASCAR K&N Pro Series West race in her 18th start, or Ana Carrasco becoming the first female motorcycle racing world champion. Here’s what women in motorsports are up to lately. Spanish motorcycle racer Ana Carrasco has done a lot in recent years, like this incredible pass she made in a World Supersport 300 race in September of last year to become the first woman to win a world-championship motorcycle race. 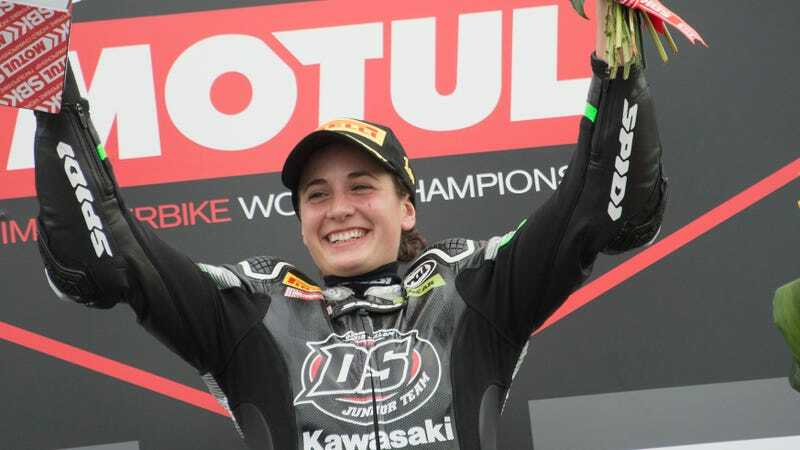 Just over a year later, this past weekend, Carrasco won the title in that series—becoming the first female world champion in motorcycle racing. She did it by a nail-biting one point, too. Carrasco won the Portugal World Supersport 300 race last year, and dominated the Imola race in Italy earlier this year to win it as well. She went into the final race of the season with a 10-point advantage over her teammate Scott Deroue in the standings, according to Motorsport.com, and salvaged a bad starting spot of 25th to win the title by a single point. With three laps to go, Carrasco found her way into the points in 15th, while [title rival Mika] Perez dropped to third, and was demoted further to fourth on the penultimate lap. Carrasco finished 13th in the race, winning the championship title by a point over Perez. Deroue finished third in the standings, 13 points back from her. 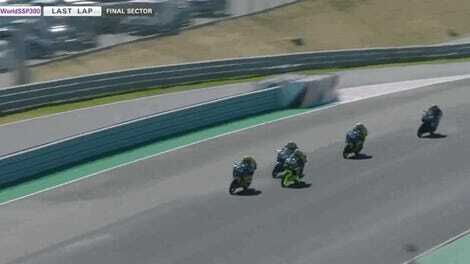 The championships aren’t stopping with motorcycle racing. British GT driver Flick Haigh, who became the first woman to take an overall win in the sports-car series’ 26-year history in April, won the championship last month. British GT had its final race of the season at Donington Park on the weekend of Sept. 23. The series runs with two drivers per car, and Haigh and her teammate Jonny Adam started fourth in their Aston Martin V12 Vantage GT3 while their closest title rivals, Jon Minshaw and Phil Keen, won the pole for the race. Minshaw and Keen ended up winning the race, but it wasn’t enough to win the title—Haigh and Adam finished where they started in fourth, winning Haigh her first championship and Adam his third in the series. Haigh said she was “a bit nervous” the morning of the race, but that everything calmed down once she got in the car. It’s not a race in the traditional sense, since the Yalla Banat website says up to 250 cars driven by women will make two laps at low speed behind a control car. But it’s an incredible message to send, with the recent lift of the ban on Saudi women drivers. Saudi women have been allowed to drive since this summer, with thousands of women signing up for driving lessons earlier this year and Saudi woman Aseel Al-Hamad driving a Formula One car the day the ban lifted. This isn’t the first race that Saudi women have competed in since the decades-long driving ban was lifted. The first women’s go-karting race was held in Saudi Arabia a month ago. Ten contestants competed for prizes worth over $2,500 in Jeddah, with Saudi national Amjad al-Umry crowned the winner. Due to an increase in demand, the Kingdom has also a surge in the number of driving schools catering for women. A motorsports star who has yet to be announced will also be at the car rally, according to Emirates Woman. It’s been good to be a woman in some of the Formula 3 championships around the world lately. Both Jamie Chadwick and Sophia Floersch have reached some milestones lately, like Chadwick winning her first race in British F3 in August and and Floersch scoring her first point in European F3 late last month. Chadwick became the first woman to win in British F3 when she finished first at Brands Hatch, with ESPN reporting that she started in fourth and ran in second for most of the race. The leader, Pavan Ravishankar, got a 10-second penalty for jumping a start, according to ESPN, meaning Chadwick got credit for the win. “I knew that he [Ravishankar] was going to get a penalty but I was hoping it would be a drive through so I could get my head down and I wanted to win on the road,” said Chadwick. “This win is more about showing that it’s possible [to win as a woman]. When I’m on the money I know I can be the quickest or one of the quickest. Chadwick’s first win means she now sits eighth overall in the 2018 British Formula 3 Championship. Chadwick finished fourth in one of three races at British F3’s most recent round, and the series has one more race weekend left before the end of the season. Motorsport.com reports that Floersch, meanwhile, scored her first point in European F3 with a 10th-place finish at Red Bull Ring in Austria late last month. Floersch isn’t running the full European F3 season, since she made her debut at 17 years old in July of this year. Still, Motorsport.com quoted her as saying she was “convinced that [she] will learn a lot” in the series. “I have, more than ever, an excited feeling about my future career,” Floersche said.